Liberal internationalism has been the West’s foreign policy agenda since the Cold War, and the West has long occupied the top rung of a hierarchical system. In this book, Hilton Root argues that international relations, like other complex ecosystems, exists in a constantly shifting landscape, in which hierarchical structures are giving way to systems of networked interdependence, changing every facet of global interaction. Accordingly, policymakers will need a new way to understand the process of change. Root suggests that the science of complex systems offers an analytical framework to explain the unforeseen development failures, governance trends, and alliance shifts in today’s global political economy. Root examines both the networked systems that make up modern states and the larger, interdependent landscapes they share. Using systems analysis—in which institutional change and economic development are understood as self-organizing complexities—he offers an alternative view of institutional resilience and persistence. 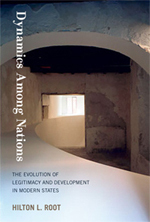 From this perspective, Root considers the divergence of East and West; the emergence of the European state, its contrast with the rise of China, and the network properties of their respective innovation systems; the trajectory of democracy in developing regions; and the systemic impact of China on the liberal world order. Complexity science, Root argues, will not explain historical change processes with algorithmic precision, but it may offer explanations that match the messy richness of those processes.